From the 1980s to the early 1990s I had a successful career as an electrical contractor in San Diego, California. In 1992 I had a sudden onset of Chronic Fatigue Syndrome Immune Dysfunction. A multitude of symptoms arose from what turned out to be an overly stressed lifestyle. I wasn’t excessive in anything but work. I considered myself to be physically healthy; I ate well, and I didn’t smoke or drink. I was just over worked. The illness disabled me. I wasn’t able to think clearly, or even able to get out of bed in the morning. I suffered from skin irritations, digestive disorders, extreme environmental sensitivity, lassitude, and fatigue. I had to give up my electrical contracting business. I proceeded to spend a lot of time and money investigating what was happening to me. I consulted with many different doctors and health care professionals. In 1993 I was fortunate to meet a German doctor who understood the role of Glutathione in chronic illness. Glutathione is the body’s endogenous antioxidant. It is needed to maintain healthy immune function and is rapidly depleted by stress. Before my illness I had no idea what Glutathione was. It is the tucked away secret that has been intentionally downplayed in allopathic (Western) medicine because most pharmaceutical drugs deplete it. The pharmaceutical industry does not want to publicize that their remedies lower your most important endogenous antioxidant, Glutathione. To help restore my Glutathione levels the doctor gave me powdered raw milk protein. I responded very quickly. In a matter of weeks my energy levels and function dramatically improved. Within two weeks I was sleeping better, and mentally alert. I felt normal again. I was elated. I had done a lot of homework on Chronic Fatigue. Recovery rates can be very slow or non-existent. I had spent many thousands of dollars with no results until I addressed a foundational component of health. I had to restore my Glutathione levels to normal before my body could recover. Thanks to the immune boosting capabilities of milk I was able to make dramatic improvements in my health quickly. 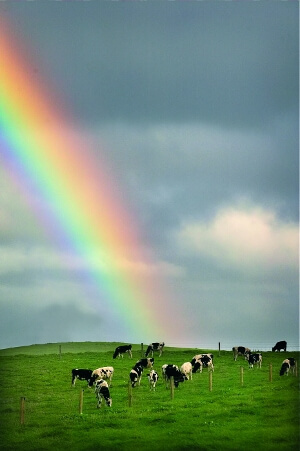 Having made the connection between raw milk and health recovery I realized there were no products available to the public like the one I had benefited from. I set out to develop such a product. I was fortunate and steadfast in doing research that lead me to a manufacturing method that maintained all the fragile immune boosting components that are present in fresh whole raw milk in a powdered form. ImmunoPro® was born in 1999. While developing the product I also followed the work of cutting-edge doctors who worked with the immune compromised, specifically those with Chronic Fatigue Immune Dysfunction. They were in a quandary about how to treat the disease. In January, 2000, I introduced ImmunoPro® to some of them and their patients got very positive results from it. Information about the product quickly spread through the Chronic Fatigue community and individuals and health care professionals began purchasing ImmunoPro®. The product was rapidly accepted because people felt it. They got results. They weren’t always pleasant results because Glutathione, as the master antioxidant, cleans up the waste matter of the cell and of metabolism. That cleanup includes removing toxins from the body. The rate of detoxification after long-term illness varies dramatically from individual to individual so a serving of ImmunoPro® could have very different effects for people. The second product in the line was GlutImmune. It was introduced because long-term stress depletes the amino acid glutamine more than any other amino acid. This amino acid is required for the health of the digestive tract. I learned that a large percentage of the people with Chronic Fatigue who were using ImmunoPro® had impaired digestion and could not efficiently absorb protein. They have what is referred to as Leaky Gut, or Permeable Gut Syndrome. They have a hard time absorbing nutrients without reactivity. For these people, the actual food components, proteins included, pass through their intestinal wall and cause a host of reactive symptoms from joint pain to skin irritation. GlutImmune replenishes glutamine in the intestinal track and begins the repair cycle necessary for proper uptake and absorption of nutrients. The free form amino acid l-glutamine, which is readily available on the market, is synthesized. Nowhere in nature would you find a synthesized amino acid, or an l-glutamine. There is quite a bit of literature written about the down side of taking a free from amino acid such as l-glutamine. Well Wisdom’s GlutImmune is a covalent bonded form of the amino acid glutamine. It is a concentrate of red wheat berries, a glutamine rich grain. Covalent bonded basically means attached to other amino acids as one would find in nature. So the glutamine in our GlutImmune hasn’t been altered or synthesized. It has an absorption and metabolic uptake that is the same as food. This is a definite advantage over l-glutamine because it provides a more even absorption and sustainability in the blood. The body recognizes it as a food and knows how to absorb it and use it. In addition to being synthesized, l-glutamine provides a very fast in-rush of glutamine but its absorption is dependent on it being taken on a completely empty stomach. If taken with food, l-glutamine will quickly attach itself to other amino acids to stabilize which will greatly reduce its effectiveness as a long term nutritrient for optimal repair. The most efficient way to repair a glutamine deficiency is to have sustainable blood levels of it throughout the 24 hour cycle. L-glutamine will give you a shotgun blast of glutamine but the decay rate is rapid and leaves you with lower levels after. 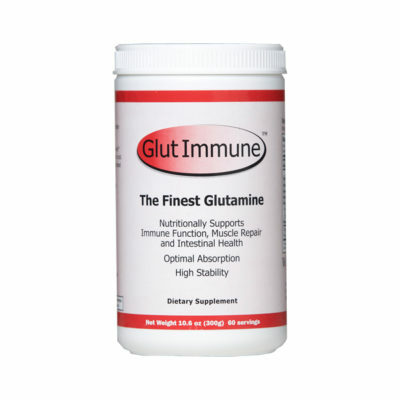 Covalent bonded GlutImmune taken throughout the day provides sustained levels of glutamine in the blood. This allows for an efficient physiological dose readily available wherever it is needed; in the intestinal tract, for mental function, or muscle repair. Colostrum is our first food. It is the pre-milk fluid of mammalian milk production. We are all designed to have colostrum at birth. Colostrum is meant to be a short term nutrient. After a few days mother’s milk turns from Colostrum to milk. We are all designed to consume milk protein from birth on. There are many discussions about milk only being needed by infants but it has been shown in research and proven in my own experience that as long as one doesn’t have a true milk allergy milk is a miracle food. Its regenerative components exceed any other food. 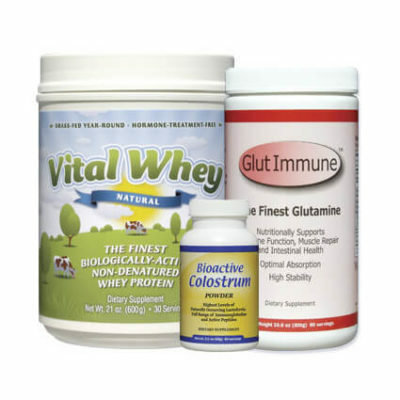 Bioactive Colostrum was added to the Well Wisdom line of products because it has a range of growth factors and other many components to give the immune system a jump start. Its role with an adult is to restart or retime the immune system. It only has to be used for a short period of time, a week or two. After, you would get back to your on-going regime of consuming native whey protein. The basic components of our native whey protein will give you, in lesser amounts, a very similar range of the components found in Colostrum. ImmunoPro® was developed for the immune compromised. Taken throughout the day, a five gram serving was more than adequate for most individuals. After many years and strong recognition of the product from the public we came out with Vital Whey. It comes in a larger container size in three flavors, natural (plain), vanilla and cocoa, and a 20 gram serving size. It is more appropriate for individuals and families who want the highest quality protein for a nutritional supplement in-between meals, for a glutathione boost, a pick up in the afternoon, a pre or post workout drink, or for families who want their children to have the very supportive immune boosting components found in our product. Currently, there is quite a bit of marketing of whey proteins and native whey protein® is being used by a wide range of companies. The most important thing to be aware of is if a company supplies a laboratory analysis of the fragile components that are contained in their product. That analysis will tell you the real finger print of a protein and the actual biological activity of the most important fragile components; lactoferrin, immunoglobulins, and bovine serum albumin. 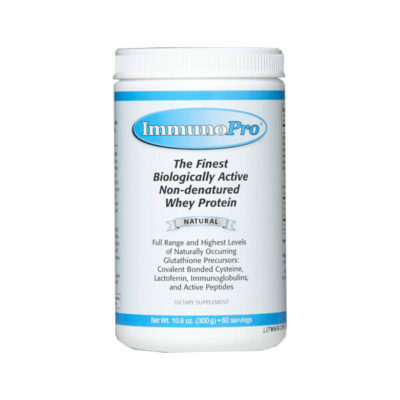 These are the crucial immune modulating and regenerative components of native whey protein. They are easily destroyed by processing. At Well Wisdom we are proud to provide the finest biologically active native whey protein available. I am grateful that I was given the food that is basically our birth right to regain my health and to have the ability to offer it to individuals who have gone through a variety of suffering and illnesses. Well Wisdom is a service business. Our products were developed specifically for individuals in need of help to recover from and to prevent relapse of immune compromised diseases. There has been a large marketing push for whey proteins for every life style. I am happy to see that awareness growing. We know that we can offer the highest quality native whey proteins® to all populations. We look forward to the word getting out on our “whey” of life.